Over the years, high-end European SUVs have been given the less than gracious nickname Remuera Tractors. Fitted with more bling than an American Rap artist, but with (if possible) less substance behind them, it’s easy to understand why. In truth, their general day-to-day use barely has them venture into a puddle or over a speed hump; sometimes (on the odd occasion, when the cafe parking is limited) it may venture onto a grass verge, but on the whole a very large percentage of the SUV’s reported off-road capabilities are never used – they remain redundant or, even worse, fictitious. 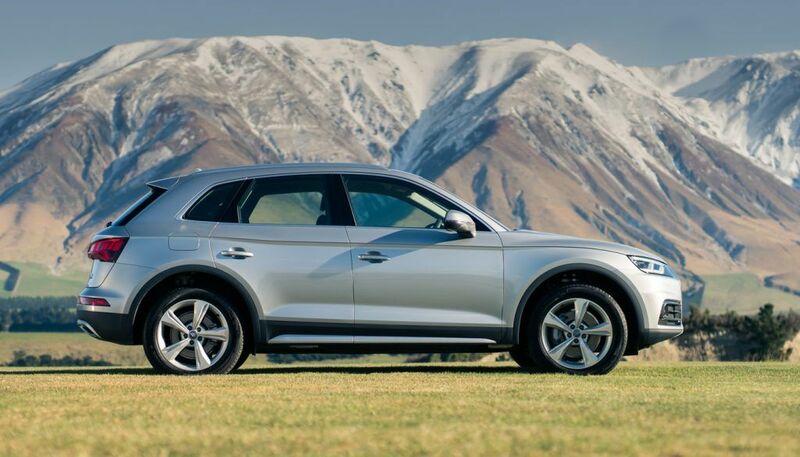 Now, having just returned from the New Zealand launch of Audi’s new Q5/SQ5, I can tell you – it’s not all show. I have to admire an automotive brand that stands firmly behind its vehicles and what they are capable of, and with well over half a million dollars of new SUVs for us to play with, Audi were certainly putting their money where their mouths were. The launch of Audi’s new mid-sized 5-seater SUV started off in a similar vein to many others (albeit in Christchurch airport). Without any ceremonial introduction, we were handed the keys, lucky dip-style, to one of three variants of the new Q5 and our drive route to Terrace Downs began. I found myself behind the wheel of the TDI quattro design. As I discovered later, it has a diesel powertrain that produces 140kW/400Nm and (with its 7-speed S tronic gearbox) a reported fuel efficiency of 5.1L/100km. If I’m honest, I was initially more interested in the heated function on the twin leather seats – it was a nippy day! Aside from the near-epic South Island backdrop, the actual drive was good (great, in fact) but very familiar. The route took us along glorious rural roads and I engaged the diesel Q5’s Dynamic drive mode and enjoyed the ride. On any other day, the combination of South Island freedom and a prestigious mid-sized Audi SUV would have been more than enough to get a feel for its poise and pizzazz, but little did I know, the best was yet to come. Lunch was followed by the technical briefing, a chance for Audi to brag about the improvements – of which there are many. First of all, the driver aids have grown from 8 to 28 (I could list them, but suffice to say, braking, parking, traffic and driving ease have all been upgraded) and in short, your overall safety is front of mind for Audi. 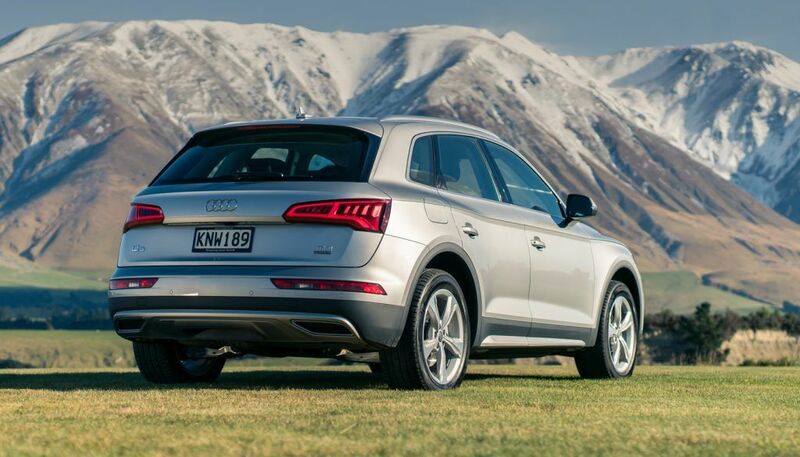 The all-new Q5 has dropped its weight – the chassis by 20kgs and overall up to 90kgs (that’s like removing most of me from the car) – but has increased in size too, which equates to more room and space inside. The exterior has been modernised too – it’s far snappier… dapper in fact, with clean lines, pronounced Audi grille, LED lights and up to 20-inch alloy feet (depending on variant). It looks every bit the Euro wagon, suitably at home in both executive and outdoor exploits. Air suspension is now an option; it adds 45mm of ground clearance when in off-road mode and will kneel down – 55mm when loading in the rear. New Quattro technology is now available with the introduction of Ultra. With its computer brain working overtime (150 signals of data 100 times a second) the drive system is both predictive and responsive, it can move in and out of quattro (FWD/AWD) within 0.2 of a second, offering substantial driving confidence and increased vehicle efficiency – nice work if you can get it. Told you there were a lot of changes! Then things got downright dirty – but in a good way. Audi had organised a real working farm for us to take our gleaming new ‘tractors’ to on an adventure. With either the Q5 TFSI Quattro Sport (185kW/370Nm) or the SQ5 (260kW/500Nm) available, there are no prizes for which one I picked. 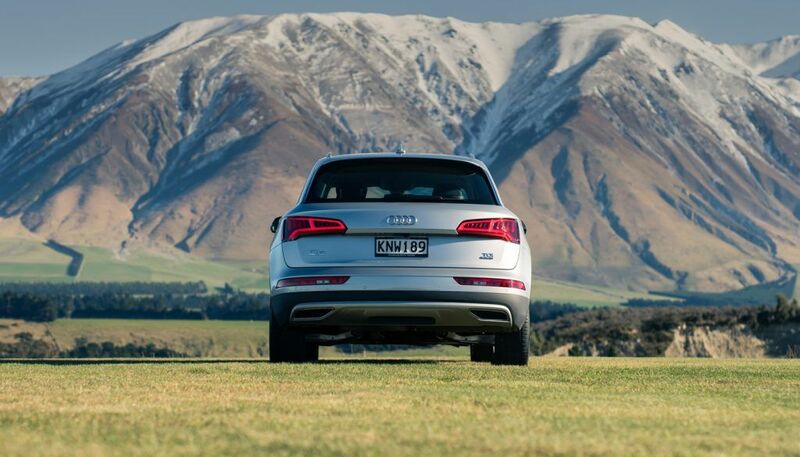 The SQ5 takes things to ‘other level’ territory. Complete with fine Nappa leather and diamond stitching furniture, inlays in matt brushed aluminium, flat bottom steering wheel, head up display, 20-inch alloys in a 5-twin-spoke star design and an 8-speed Tiptronic box, it didn’t belong out here in the mud… or did it? With the simple push of an off-road selection, and a tap on the ‘downhill descent’ one for good measure, we headed off single file, on the soft road trails, towards the mountains. The gravel-sprinkled muddy road took us through streams deep enough to awaken the parking sensors and over grit and rocky tracks, before moving on to a less than beaten trail of boggy and undulating mud ruts. We climbed (well the Q5 did) up very slippery grass hillsides, where the road tyres span with glee and let Audi’s traction control work its quattro magic as we descended the other side – essentially hours of going uphill and down dale – all very uncharacteristic territory for our tricked out and swish Euro SUVs – but they (and we) loved it. The trek included a stop for some shotgun clay pigeon shooting fun – many of which remained unharmed (evidently we are ‘marginally’ better drivers/reporters than hunters). There was also a gloves (and traction control)-off mud drifting session – a chance for your rural bogan to let loose – and boy, did we! Call it another way to plough the fields, but we snaked the Q5’s tail round the paddock in muck-hurling style – I pity the poor groomers. 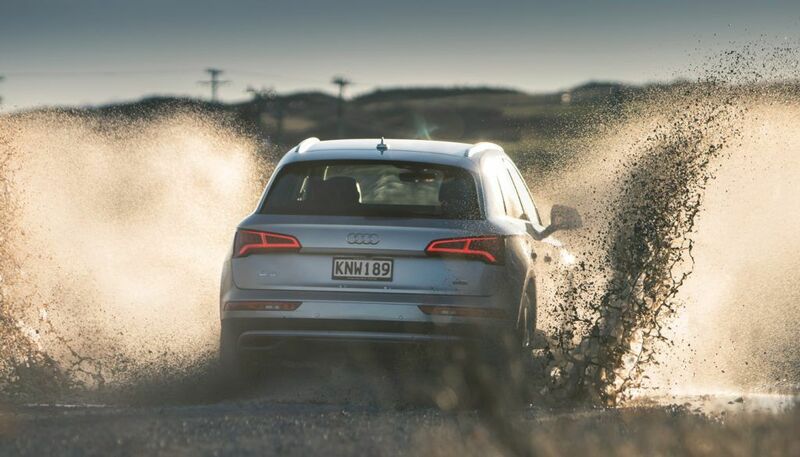 With the farmyard frolicking over, we headed back to the airport in a sedate and orderly fashion – far more in keeping with Audi’s regular image (aside from the fact that they would have been hard to recognise, so caked in mud). 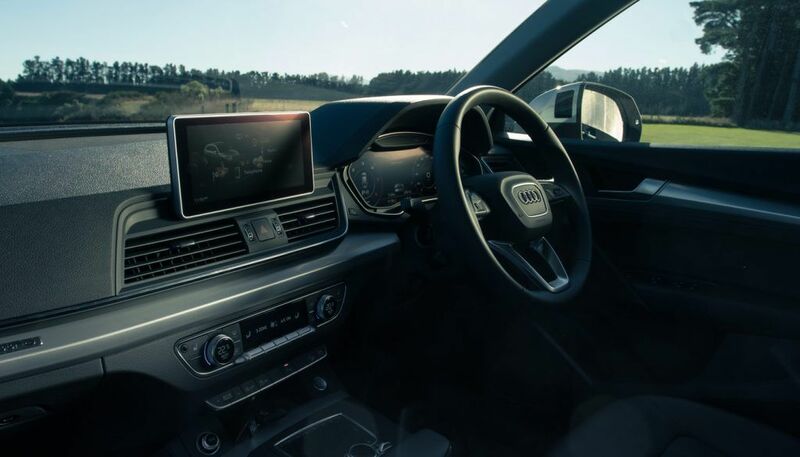 Over the years, high-end SUVs have been dismissed as all glory but no guts; I say drop the kids off at school, grab your favourite hot beverage and head for the hills – both you and the Q5 deserve the experience. After all, it would be a shame not to use that off-road button.